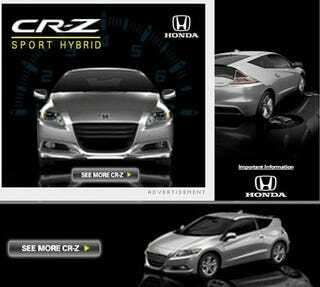 Honda CR-Z Sport Hybrid: Finally, An Exciting Hybrid! Confirming what we've seen in leaked brochure scans, the production Honda CR-Z Hybrid has been outed as the small and sporty Prius alternative with a hybrid-first six-speed manual transmission. The leaking culprit? Honda's premature marketing department and AOL. The screengrabs above are from ads on Autoblog, who, we're fairly sure, are completely unaware their ad sales team posted shots of their new car a few hours before it officially debuts. We, however, noticed. If the more production-ready fascia and headlights weren't a giveaway, the Honda badge located above the grille was a clear indicator this isn't the concept. Information about what kind of power is backing up the CR-Z will have to wait until later, but the ad clearly says "Introducing The First Six Speed Hybrid" and shows a manual transmission — something not found on other U.S. hybrids. We can't wait to row our own gears in a freaking hybrid. Still, we kinda wish Honda could have just jettisoned the hybrid and swapped in an "X" for a "Z," but we can't be too greedy, can we.